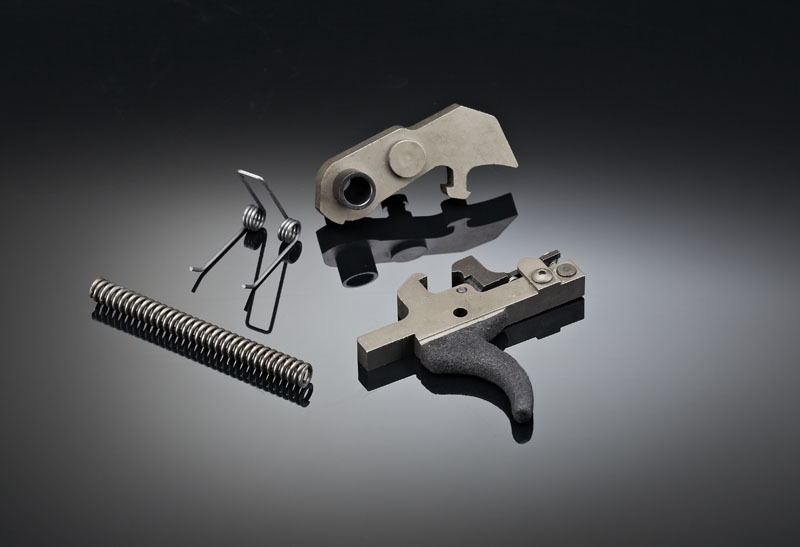 A premium 2-stage trigger/hammer for the SCAR platform, featuring sharper breaks, faster hammer locktime, and higher ignition energy than any other SCAR trigger. Temporarily Out of Stock. Contact us to be notified when they are back in stock. Current ETA is mid-April. This RPS Trigger™ is a premium 2-stage trigger/hammer for the SCAR platform, featuring sharper breaks, faster hammer locktime, and higher ignition energy than any other SCAR trigger. All components are CNC from Rolled Plate Steel – not cast. · Adjustable for second stage sear engagement and second stage pull force. 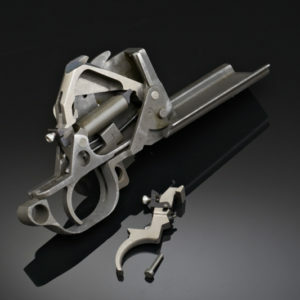 · Includes replacement trigger spring, to control first stage trigger pull, allowing minimum of about 3.5lb (2lb first +1.5lb second stage), up to 3lb first + 5lb second stage. · Refined design reduces hammer swing time 2ms faster than stock (from 9ms to 7ms), and increases firing pin energy for superior ignition. – NEW! 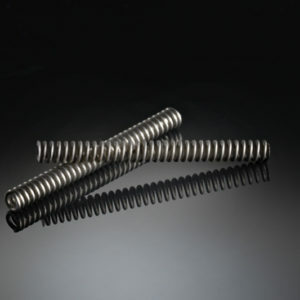 Now includes High Energy Hammer Spring, which reduces hammer swing time by an additional 1ms (to 6ms). · Fits both SCAR 16 and SCAR 17. · Works on both Black and FDE models. 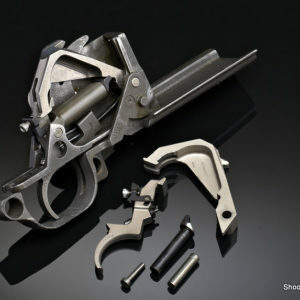 · Drop in parts can be installed and adjusted in minutes (gunsmith installation recommended). Outstanding trigger! Some people don’t like adjustable triggers in fear of messing it up, but I love it. Play with it, get it to your liking and it’ll be far better than the Geiselle trigger. And with a much kinder price point, it’s well worth it. 5 Stars PLUS! This is well worth the $250 price. As the ONLY Adjustable 2 stage trigger for the FN SCAR, this product simply out performs the MUCH more expensive Geissele and Timney offerings. The details: I am in my 50’s, my eyes are not what they once were, but I love shooting good groups at distance. From the first shot I was seriously impressed. The smooth light pull through the first stage stops perfectly as you settle in and micro tune aim before the shot, trying to eliminate all movement. Stage 2 breaks light, clean and crisp and does not upset the aim of the weapon. I fired 120 test rounds with inexpensive brass case bulk ammo at 100 and 200 yards and was 100% on target using 4″, 6″, 9″ and 12″ targets. The first 8 rounds out of my clip where within 2″ at 100 yards on a 4″ Target. The next clip of 30 rounds was a 6-8″ group at 200 yards. With the standard heavy mil-spec trigger in the stock SCAR, try as I might, I was never 100% on target through a 30 round clip at 200 yards because the heavy trigger would frequently upset the weapon during discharge. Arts Shooting Sight RPS SCAR Trigger eliminates that problem. Importantly, It’s also an easy install for anyone who works on mechanical or other detail oriented hardware projects. I am not a Gunsmith, and had not done a trigger on a Scar until I upgraded my Scar 16. I found the written install instructions easy to follow, and used SCAR Youtube trigger disassembly and reassembly videos to add a visual element during the upgrade. I will be ordering another SCAR trigger from Art for my SCAR 17 shortly. 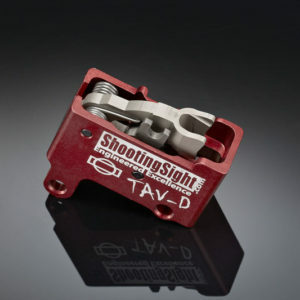 You can’t go wrong with this trigger and it makes no sense to spend more money on the big name of other triggers, as they are inferior to this set up because they don’t have the adjustable 2-Stage feature that this RPS SCAR trigger has. Great trigger. It feels just like the Geissele except it’s adjustable. I set mine just a hair heavier, but it is a very crisp break after the first stage and excellent reset.